So I've kinda put the pink bunny aside for a bit...only cause I was trying to find some fabric glue that I thought I had, but ended up waiting for Brett to take me to Walmart so I could score some (I needed the glue for the bunny's eyes...I wanted a more oval shaped eye so I want to use felt, rather than try to satin stitch it with yarn to look oval). In the meantime, I decided to try out a tote bag pattern that ended up becoming a sailor-esque tote. I'm not a fan of straight up crocheted totes with no interest to them, and I really didn't want to try to find things to applique onto it. At first I thought I would just keep the navy and white stripes as my point of interest, but then I decided it really did need the anchor. I would like to make this again, only this time using a nicer yarn. I'm currently using Red Heart yarn, which to me is an icky acrylic. I need to find a nice cotton yarn. The Red Heart was on sale at Michaels and figured it would be ok to use for a prototype. I used to strands of the yarn together throughout the tote, making the tote nice and sturdy. I haven't tried putting anything in it yet to see how it would withstand the weight, I'm waiting until I attach the handles to do so. But I think I would still like to put in a lining, that way I can have a convenient pocket for my mobile phone and another pocket to put things commonly lost in a tote in - like lipgloss and my keys. Crocheting the tote actually took me by surprise. I honestly thought I would be working on this for months. Not the few days it's been so far. Yay for me!! I know this is an old post, but do you by any chance still have the pattern for the anchor? If so, are you willing to sell the pattern or do a tutorial? 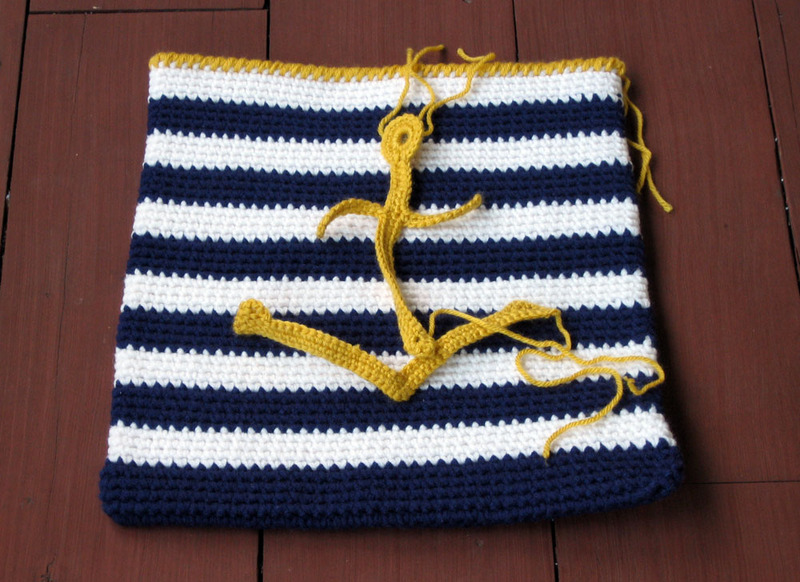 I've been looking everywhere for an anchor pattern this size, but have had no luck.